Obtaining a U.S. Visa Based on Achievement provides a comprehensive and relevant overview of the legal standards a foreign national must meet to obtain an immigrant (permanent) or nonimmigrant (temporary) work visa based on achievement. It also shows you how to effectively prepare and present evidence in support of a petition submitted to United States Citizenship and Immigration Services. Written by an attorney who has practiced immigration and nationality law since 1995 and has received countless approvals for his clients in achievement-based cases, this book provides readers with an excellent background of the United States employment based immigration process for foreign nationals with documented accomplishments in their field of endeavor. Through these various topics, this book provides a how-to guide for the submission of an achievement-based petition and furnishes information that can be utilized by foreign nationals and attorneys. Obtaining a U.S. Visa Based on Achievement is an indispensable resource that provides the essential information necessary to prepare and file an achievement-based petition with United States Citizenship and Immigration Services, which includes preparation/presentation of the evidence, along with an understanding of the legal requirements that must be met for receipt of a petition approval. 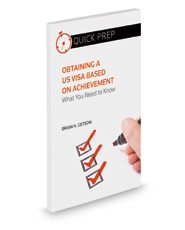 This easy-to-read book explains how to successfully prepare and file an EB-1A, EB-1B, EB-2 NIW, O-1, or P visa petition, including useful insights, an explanation of the legal and evidentiary requirements for each classification, and tips for meeting the high standard for approval in the achievement based visa categories. After reading this guide, qualified foreign nationals will be prepared to proceed with confidence in filing a petition with United States Citizenship and Immigration Services.